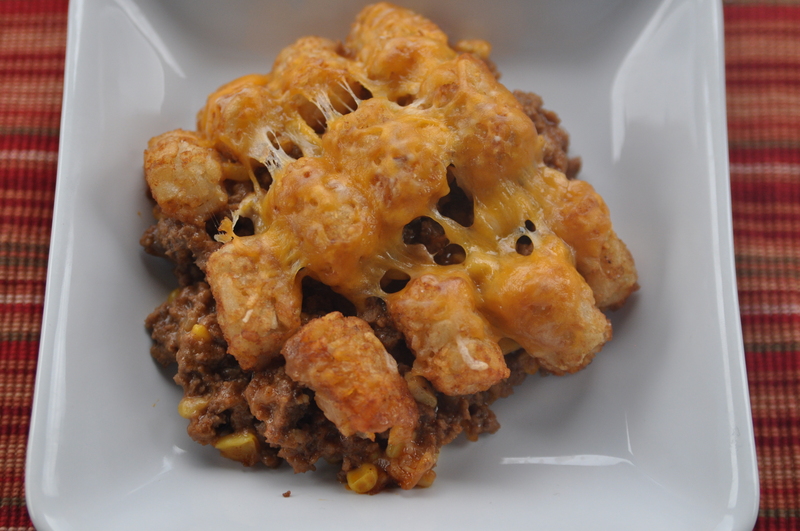 Southwestern Tater Tot Casserole – Mama, Can I Lick the Spoon? Michael had to work in Memphis for a few days this week. We miss him so much when he’s away! He was supposed to be back home by 11:30 yesterday morning. Well, you know how that is. Flight delays. Weather. He finally got home at 5:45 last night. He was tired. He really hadn’t slept the night before because he had to leave for the airport at 4:00. He was travel-worn. And he was hungry. Luckily, I had just pulled this out of the oven! My kids love tater tots. Michael loves tater tots. I love tater tots. 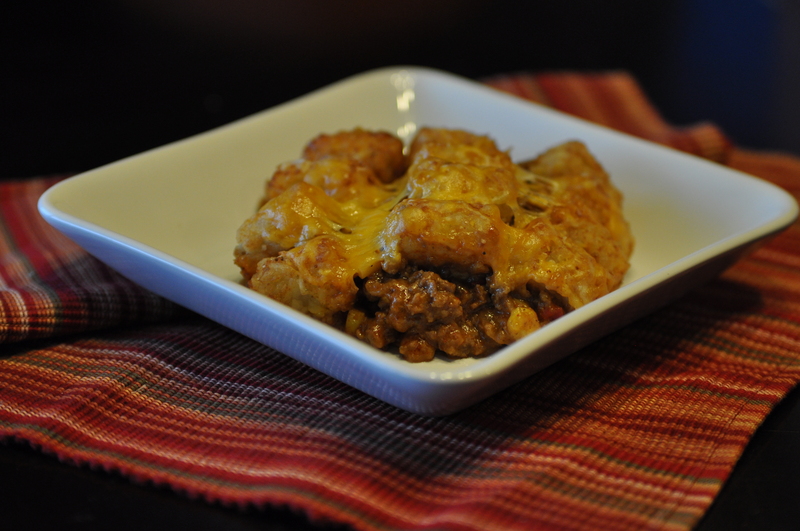 I’ve seen countless recipes for tater tot casseroles. But I made a few changes and made it my own. This is SO good! Brown the ground beef with the water, onions, and salt until meat is cooked through. Drain completely. Return meat mixture to the pan. Add taco seasoning, corn, and soup. Stir until combined. Pour mixture into 2 9X13 baking pans. If freezing, cover tightly with aluminum foil and label. Allow to cool before freezing. If baking immediately, place in the preheated oven and bake for 55 minutes. Sprinkle the top with cheese and return to the oven for 5 more minutes or until cheese is melted. Well Duh #1: You can absolutely cut this recipe in half. I just like to eat one and freeze one. Well Duh #2: I did not use all of the tater tots. I had a few left over. Well Duh #3: You can dump the tater tots on top, or you can lay them out in perfect OCD rows like I did. I think they cook better if they are in a single layer. And they look happier when they’re in straight rows. Well Duh #4: If you are freezing your casseroles, don’t add the cheese. Just freeze without it. When you’re ready to bake it, place it in the refrigerator in the morning to thaw a little. Bake for 1 hour and 15 minutes – or until heated all the way through. Then add your cheese and bake for 5 more minutes. Everybody in the family loved this! I made it early in the day, so I covered one of the dishes with plastic wrap and put it in the refrigerator to keep until time to bake it. One of my children – I won’t say who, but it won’t be hard for you to guess – actually ate two tater tots off the top. Two FROZEN tater tots! Just picked them off and ate them. FROZEN! Good thing I had some leftover tots to add to it because those two empty spaces would’ve driven me crazy!! Twenty-One Casseroles for Healthy Appetites – Mama Can I Lick the Spoon?